I don't know about you, but there are days when soup is the only thing I want to eat. Easy to cook, nourishing and portable, it's almost a perfect meal, if you're heating the stuff from a can. It's a little more complicated if you're making it from scratch, but once you have a batch made, soup freezes like a dream. There are also a lot of warm memories attached to soup. It's comfort food and the science says there is something good in chicken soup that helps a body get through and recover from the flu or a cold. I don't make Campbell's soup with all the water they say on the can. I usually use just a half of a can. I like the taste of the broth and I buy the lower sodium version. It tastes a lot like dumping chicken parts in water and cooking them for an hour. I eat the whole can. It says 2 servings, but seriously, unless I'm eating a bunch of other things with my soup, I eat the whole can. I usually use the mug on the left, but I couldn't find it. (It was under the dishes not put away in the drainer.) I thought the mug on the right was the same size but it wasn't. I had to drink some of the broth in order to put the entirety of the can into the mug. 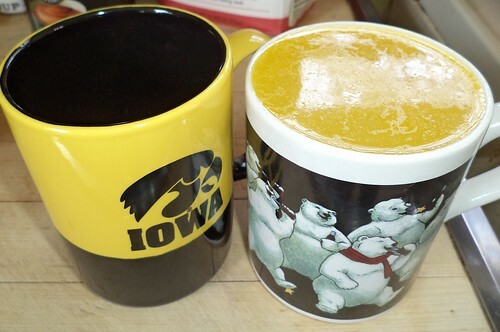 In checking, the Hawkeyes mug is an eight of an inch taller. That eighth is just enough to make it big enough to hold all my soup. This was chicken and stars soup. My grandmother used to have this whenever we came to visit. It was too expensive for my parents to buy and the only time Gram used to have it was when we were coming. She'd serve this with ham sandwiches. I don't find chicken and stars to be any less expensive than chicken noodle so I like to keep a can of this and tomato soup in the pantry. Chicken and tomato. Good meals. I just need to keep the Hawkeyes mug clean.